Arthur A. Levine Books. Hardcover. 043932162X Mild to moderate shelf/reading wear. Binding good. Orphans Treasure Box sells books to raise money for orphans and vulnerable kids. . Good. Arthur A. Levine Books. Hardcover. 043932162X Some wear. In a rubbed box. . Good. 2001-11-01. Arthur A. Levine Books, 2001-11-01. Hardcover. Used: Acceptable. Excellent customer service. Prompt Customer Service. Scholastic, Inc, 2001. Reprint. Hard Cover. Near Fine/No Jacket. Near fine. 2001 Hard Cover. Includes publisher's slipcase. When first released to Muggles in March 2001, Fantastic Beasts and Where to Find Them and Quidditch Through the Ages further enlightened Harry Potter fans about the dangers and delights of the wizarding world. Now these two charming works of non-fiction are available in hardcover -- in a special keepsake slipcase edition! Arthur A. Levine Books. Hardcover. 043932162X Please allow 4 - 14 business days for Standard shipping, within the US. Thank you for supporting our small, family-owned business! . Fair. 2001-11-01. 2001-01-08. Good. Ships with Tracking Number! INTERNATIONAL WORLDWIDE Shipping available. May not contain Access Codes or Supplements. May be ex-library. Shipping & Handling by region. Buy with confidence, excellent customer service! New York: Scholastic Book Services, 2001. Book. N-Fine. Hardcover. Later Printing. Both titles are square solid carefully read copies. A nice set, nice addition for your Harry Potter collection. The individual ISBNs on these books are 0439321611 and 0439321603. 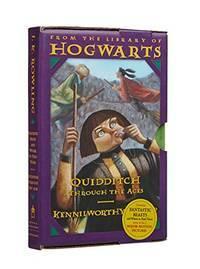 Fantastic Beasts etc.....written by Newt Scamander and Quidditch Through the Ages written by Kennilworthy Whisp. The illustrated slipcase has some light rubbing wear else fine. THIS COPY IS IN MY POSSESSION AND NORMALLY SHIPS NEXT DAY..
Arthur A. Levine Books, 2001-11-01. Hardcover. Like New. As new two slender hardcovers in slipcase. Look unread. Please email for photos. Scholastic Press. Hardback. Fine/Not Issued. 2001. Hardback. Fine. First Edition. Later Print. This is a two book set. These two books, Fantastic Beasts & Where To Find Them (Second Printing) and Quidditch Through The Ages (First Printing). These books are the original green and red and are incased in the original slipcase. 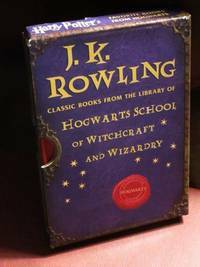 Kennilworthy Whisp and Newt Scamander are pen names used by J.K. Rowling when she wrote these two Hogwarts school books. Excellent addition for your Harry Potter collection. Books are packed and shipped in boxes. Arthur A. Levine Books, 2001-11-01. Paperback. Used:Good. Scholastic, 2001-01-01. Hardcover. Very Good/Very Good Slipcase. Two-volume set, hardcovers, in slipcase. NOT ex-library. Both books are tight and clean, shelfwear is minimal. All-around very good condition. Ships from Dinkytown in Minneapolis, Minnesota. Arthur A. Levine Books. Hardcover. 043932162X Please allow 4 - 14 business days for Standard shipping, within the US. Thank you for supporting our small, family-owned business! . New. 2001-11-01. Arthur A. Levine Books. Hardcover. 043932162X Please allow 4 - 14 business days for Standard shipping, within the US. Thank you for supporting our small, family-owned business! . Fine. 2001-11-01. New York: Scholastic Book Services, 2001. Book. Near Fine. Hardcover. First Edition/First Printing. Both titles are square solid tight clean copies with some reading wear. The first state illustrated slipcase has some very light edge wear else fine. A nice set, a nice addition for your Harry Potter collection. The individual ISBNs on these books are 0439321611 and 0439321603. 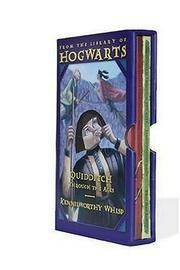 Fantastic Beasts etc.....written by Newt Scamander and Quidditch Through the Ages written by Kennilworthy Whisp. 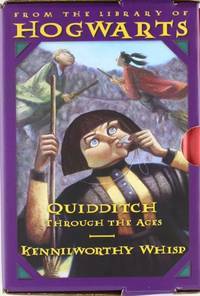 The Quidditch title has a previous owner's name blacked out on the ffep and has two corner bumps. .
2001-01-08. New. Ships with Tracking Number! INTERNATIONAL WORLDWIDE Shipping available. Buy with confidence, excellent customer service! Scholastic Press. Hardback. Fine/Not Issued. 2001. Hardback. Fine. First Edition. First Print. This is a two book set. These two books, have been reprinted many times. These green and red books are the true first print. 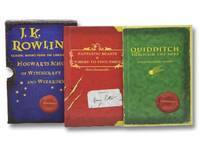 Fantastic Beasts & Where To Find Them and Quidditch Through The Ages are incased in the original slipcase. Kennilworthy Whisp and Newt Scamander are pen names used by J.K. Rowling when she wrote these two Hogwarts school books. Excellent addition for your Harry Potter collection. Books are packed and shipped in boxes.